When it comes to your dog and vehicle travel, Canine Covers provide the most comfortable way for your dog to ride in style while protecting vehicle seating surfaces, floor, seatback and cargo areas from pet hair, scuffing and accidents. Dog experts agree that that your dog's comfort is the key to a successful trip. The first Canine Cover Dog Seat Protector was developed in 1998 and the product line now includes your choice of custom, semi-custom and universal-type seat protectors, custom cargo area covers, door shields and pet travel restraints. We also offer plush easy-to-clean dog beds for home use or travel. 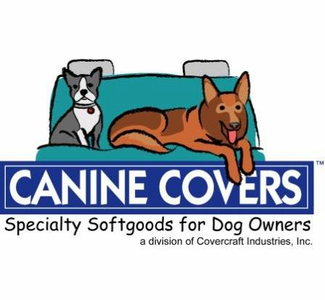 All of our Canine Covers products provide excellent vehicle interior protection and are easy to use...but most importantly they will provide comfort for your traveling pet. Quality products, designed and built by the quality team at Canine Covers! Canine Covers come in many different styles. Click the links below to view and shop each style.